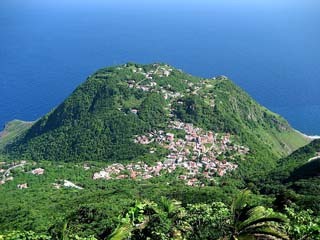 Saba is dominated by Mount Scenery, a potentially active volcano. At an elevation of 2,877 ft. (877 m), its lava dome forms the summit of the island. The hilly surrounding landscape slopes sharply to the sea, and much of those hills are covered with woodland rain forest. Heavy rains (on occasion) forces water to cascade down the volcano, however, there are no permanent rivers.